All databases are backed up and transferred off site nightly. As part of the document storage process files have a SHA-1 (Secure Hash Algorithm 1) hash calculated and then the files are compressed and encrypted. The SHA-1 and the encryption keys are stored in the client's database. The compressed encrypted documents are stored on multiple file server nodes in the cluster. Each night the encrypted documents are replicated off site. Now you can publish an article to your website and easily distribute it via email to a list of Contacts. 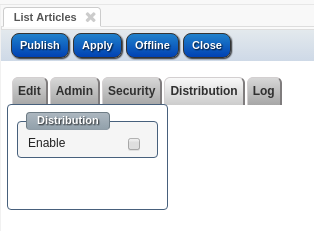 Go to the main menu and click on Articles/List Articles, find the published article you want to distribute, go to Distribution tab, and check "Enable" checkbox. On 25.09.2014 a severe internet security alert was issued for many Linux/Mac systems. stSoftware immediately patched all our cloud hosted servers in response to this alert. We advise individuals or organisations with Unix-based systems they will need to patch all internet facing Linux/Mac servers immediately. See Severe Bash vulnerability affects Unix-based systems including Linux and Mac OSX for more information on how to manage this internet security issue. Can the system be customised whether it's hosted as a cloud service or installed on our own server? Hosted or installed - all stSoftware's web systems can be tailored to suit client's requirements. We offer Continuous Improvement Programs which deliver customisations and updates as a discounted monthly service or Ad-hock services. What's best practice software maintenance for self-hosted systems? 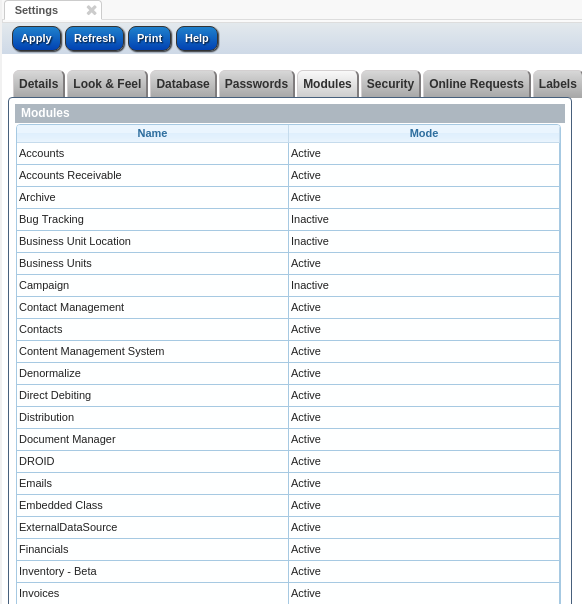 The new powerful, stylish and responsive Control Panel menus, in the latest version JobTrack (Version 5). Introduction to JobTrack (Version 5). Responsive and Collapsible Menu Features. The Heartbleed Bug is a recently discovered vulnerability in the OpenSSL cryptographic software library used by many of the world’s web servers to secure information using TLS. If the web site is vulnerable then a hacker could expose 64k of the server's memory without any trace in the server's logs. The server's memory exposed could include the server's private encryption key or other information such as usernames and passwords. stSoftware's professional IT and development services are provided by our own web and cloud experts in Australia who are highly trained and experienced. Professional service packages are very popular with our clients as they can utilise the full range of our IT services at discounted rates. Packages include Continuous Improvement Programs (CIP) or Professional Service Packs. Can you explain your development, staging and disaster recovery environments? We normally use our own in-house development servers, as they are already setup and configured to our solution server requirements it is cost effective and efficient. What is the new Timeline module? Timeline is more than a graphical representation of your JobTrack data, it is interactive allowing you to link back to the item with a click to see the full details, edit and add details. The system comes with a number of standard components but any valid script/HTML can be added as a component using the ActiveHTML component. The stSoftware CMS is a complete online solution with everything you’d expect from an advanced CMS, plus a whole lot more to give you greater control over your website and business data, and unify your communications. Designed to make it easy to manage the flow of content across multiple websites, our CMS is the ideal solution for group-based organisations such as franchise networks, enterprises and government agencies. What are the security, back-up, disaster recovery and firewall services? Industry standard best practice for passwords for both the web server and Linux machines. Site designers do not have direct access to the underlying Linux server, the raw database or files. All changes are done within sandbox of the system. ReST which returns data in both JSON and XML formats. Well supported with adequate and timely technical support. Check our BLOG page for quick answers to some of our most common support requests. JobTrack is used to coordinate the workflow to achieve these through puts. What to do when you get an email warning about "variable is deprecated"
You may have seen email warnings about "variable is deprecated". The system has been updated to warn if an email variable or bit of code which is 'deprecated' or out of date (I had to look up what that meant! - see https://en.wikipedia.org/wiki/Deprecation). You can click Continue to send the emails and it will be fine.